Deloitte’s global survey of more than 1,000 global blockchain-savvy executives from seven countries and nine industries is a leading indicator of where blockchain is headed. Adding some extra shade to the conclusions of the global survey, we conducted a non-representative inquiry in Central Eastern European countries. While not quite ready for primetime yet, blockchain is getting closer to its breakout moment with every passing day. In the US and in some Western European countries the momentum is shifting from a focus on learning and exploring the potential of the technology to identifying and building practical business applications. 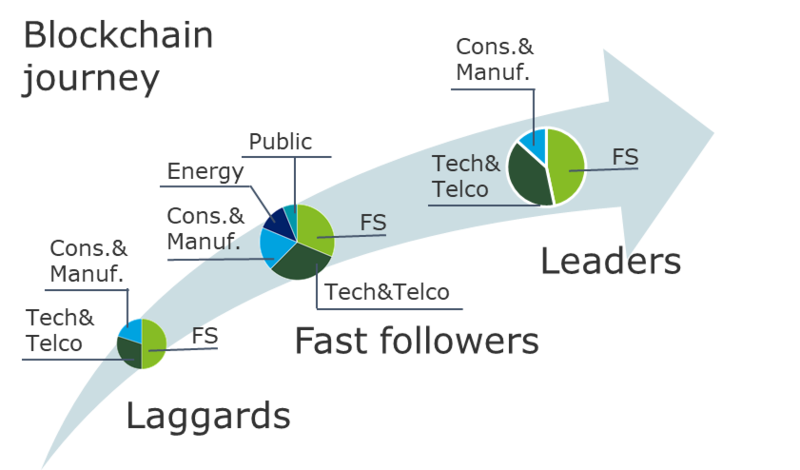 The global executives with excellent-to-expert knowledge of the technology we surveyed hold more pragmatic views and look poised to make some major moves over the next year. The adoption of blockchain is still in its early stages across CEE and EMEA as well, although at different speeds in different sectors. Overall, however, there is strong belief in the long-term impact of blockchain to help transform business. Globally we see that blockchain is at an inflection point, with momentum shifting from “blockchain tourism” and exploration of the technology’s potential to the building of practical business applications. This is particularly true among “digital enterprise” organizations, rather than in more traditional enterprises that are still working on how to incorporate digital into their existing operations and protocols. At the same time, globally we see a trend of traditional enterprises putting more resources behind blockchain than previously, in an effort to achieve greater efficiency and to develop new business models and revenue source. Despite traditional enterprise respondents' interest in blockchain's capabilities, nearly 39% of the broad global sample said they believed blockchain was "overhyped." In the United States, meanwhile, this number is higher: 44% of respondents view blockchain as overhyped, up from 34% in a 2016 survey by Deloitte. On their own, these numbers seem to indicate that blockchain is moving in the wrong direction. However, we believe this change in attitude is more reflective of the shift toward the pragmatists in the blockchain community. In the CEE region, more than half of the respondents believe that the whole blockchain story is overhyped, but 45% of them also believe that this technology will disrupt their industry, and their company will lose competitive advantage if they don’t adopt blockchain. Mostly the Energy&Resources and Technology/Media/Telecommunication sectors have identified a threat for their business if they ignore blockchain, but 42% of the respondents from the Financial Services sector share the same opinion. The Financial Services sector was one of the first industries to explore blockchain and is recognized globally as an industry with high potential to be truly impacted by blockchain technology. Also in our survey, more than one-third (38%) of respondents identified themselves as working in financial services. After the recovery from the financial crises, banks need to face with the challenge of innovation, fast shifting customer needs and the threats and opportunities brought by Fintechs. In line with these new trends, blockchain is becoming a hot topic, but the FS industry also tends to believes it is overhyped, and majority of the respondents say that the new technology will be relevant for the industry, but it will not disrupt their market. One quarter of them have already taken part in a consortium with other players to investigate the potential use cases of blockchain. The CEE survey was conducted online between 12 Oct and 9 Nov 2018, covering ten countries in Central and Eastern Europe: Lithuania, Poland, Czech Republic, Slovakia, Hungary, Slovenia, Croatia, Serbia, Romania and Bulgaria participated in the sounding. The respondents covered six industries, the majority of the survey participants represent companies from the Financial Services (34%), the Energy and Resources (25%) and Consumer Products and Manufacturing (23%) industries. The respondents came mostly from C-level leaders and managers, who act as decision makers in Finance (38%), IT (24%), Strategy (11%) or Innovation (10%) field. When asked if they believed that blockchain was just “a database for money” with little application outside of financial services, just 18% of US respondents agreed with that statement versus 61% of respondents in France and the United Kingdom. Meanwhile in CEE two thirds of the respondents believe that blockchain offers much more than just a new technology for payments, and it will have an effect on several industries besides the financial sector. What many enterprise executives are still struggling to see, however, is that blockchain represents a fundamental change to their business. This helps explain that while a majority (74%) of our global survey respondents report that their organizations see a “compelling business case” for the use of blockchain technology, only 34% say their company has initiated deployment in some way. 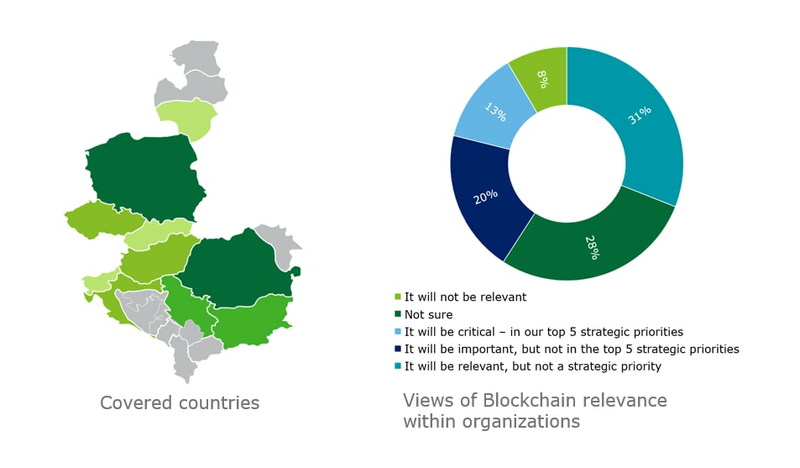 In the Central Eastern European Region, only 8% of the respondents believe that blockchain will not be relevant for their companies, but almost 30% of them are unsure of the question. Almost two thirds of the survey participants believe that blockchain will be relevant for them, but only one third say that the adoption of the new technology is important or game changer for their company and they handle it with priority. From industry point of view most of the identified industries say that blockchain is relevant, but not a strategic question for them, except for the Technology/Media/Telecommunication sector, which believes that the technology is important to accelerate their business. Our global survey data shows that a significant percentage of early adopters in the business community (59%) believe in blockchain’s potential to disrupt and revolutionize their industries, and the overall economy. The problem, respondents say, is that for all the talk about blockchain’s promise, there are very few active use cases they can currently employ to advance their beliefs. 76% of the CEE respondents share the idea that blockchain will reach the mainstream adoption, but only 27% of them are planning to replace part or all of their existing system with innovations based on the new technology. Most of the CEE respondents have not yet started to invest into blockchain technology, only one quarter of the respondents claimed to have made investments so far. Three quarters of these investments were less than EUR 200 K, but there were respondents with more than EUR 2 million investments done on the field. These investments have been manifested mostly in FS and Technology/Media/Telecommunication sectors, but there were some expenses also in the Consumer Products & Manufacturing and Energy & Resources sectors. According to the CEE survey participants, new business models and new revenue sources are the most important advantages of the new technology, but the greater security and lower risk are also great advantages according to the covered sample. Only 4% of the respondents say that blockchain cannot bring any new advantage compared to the existing technologies. Almost 60% of the respondents believe that blockchain based solutions are safer than the traditional ones. The existing use cases in CEE are mostly related to digital recording and payment solutions, but there are prototypes under construction for digital identity and also for supply chain traceability. Only 10% of the existing use cases aim at digital currency. Private blockchain solutions have the highest popularity in every covered sectors, but FS and Technology/Media/Telecommunication sectors are open for the public solutions too. The blockchain related investments made by the companies in CEE are realized mostly in consultant fees or HR investments into blockchain skills. There are some companies who are developing front- and back-end solutions based on blockchain technology, others have ongoing projects on existing system replacement. Considering the planned investments for the next calendar year in CEE the trends are similar to the past years’. More than half of the respondents are not planning or have not decided to invest into blockchain, but a few of the respondents claimed that their companies are planning significant expenses in the next calendar year. Almost 30% of the CEE respondents stated to invest at least EUR 100 K into the technology in 2019, and there are some big players who consider allocating between EUR 200 K and 2 million to these type of innovations. Some new players will appear in the region who are planning to start exploring the technology, but only with baby steps, less than EUR 100K amount of funds. Technology/Media/Telecommunication and Energy & Resources sectors will have the highest demand on the workforce and consultants with blockchain expertise, and these sectors have the biggest appetite to invest into any type of blockchain based solutions. Public sector respondents in the CEE region are those who would like to invest only into external experts, and they are not planning to invest in changing the existing systems. Among the general public, early adopters, such as crypto-currency traders, have helped to bring mainstream notoriety to blockchain. For all this advocacy, however, there remain a significant number of skeptics who view blockchain as the overhyped engine behind a volatile and unregulated financial market. As a result, a certain “blockchain fatigue” is beginning to set in among those who feel its potential has been over-communicated, while its real-world benefits remain elusive. Regarding the external influencer groups, most of the respondents of our CEE survey (41%) say that there is no external factor in their decision about blockchain adoption. The other part of the survey participants highlighted customers (28%), partners (27%), suppliers (21%) and market analysts (13%) as external opinion leaders who influence their decisions regarding blockchain technology. At an industry level globally, there are emerging consortia being formed to drive industry-specific use cases. In reinsurance, B3i—made up of 14 reinsurances—is building solutions for its members. R3, the global financial services consortium, has a major development platform in London, while a number of banks have formed the Digital Trade Chain consortium to build a trade finance solution. In Norway, DNV GL went live last year with a business certification solution on blockchain and, in France, a consortium of asset managers has launched a blockchain fund distribution platform, Iznes. In the CEE region almost two thirds of the respondents are unsure at the moment about their attitude on cooperation with competitors in a consortium with a role of blockchain based service development. 13% of them are already participating in a formal group, which works on blockchain based solutions while some companies from the Technology/Media/Telecommunication sector are currently considering entering into such collaboration. Based on our survey, in CEE blockchain is not recognized as a high priority issue in the business. The lack of in-house capacity and regulatory issues are also blocking the future steps, and only 1% of the respondents believe that there is no barrier to invest into the technology. Comparing the CEE respondents’ attitude to their direct competitors in blockchain readiness, almost quarter of them consider itself one of the leaders (22%), and another 23% say that they are fast followers. Players of the FS and Technology/Media/Telecommunication sectors are the most confident; more than 40% of the respondents coming from these areas believe that they are in a good position in the blockchain adoption competition. When looking at the insights developed from the Deloitte 2016 global survey, the data suggested that blockchain adoption—and its move into production—would have happened at a faster pace than we have seen so far in 2018. Still, even though blockchain is rolling out in a more moderated fashion than expected, its adoption remains promising. CEE is a few steps behind the US and the Western European region in the blockchain adoption journey, choosing to wait and see which way the cat jumps. Still, the view further down the road is an inspiring one. We see blockchain enabling a completely new level of information exchange both within—and across—industries. The only real mistake we believe organizations can make regarding blockchain right now is to do nothing. Even without a completely solid business case to implement, we believe that organizations should at the very least, keep an eye on blockchain so that they can take advantage of opportunities when they present themselves.